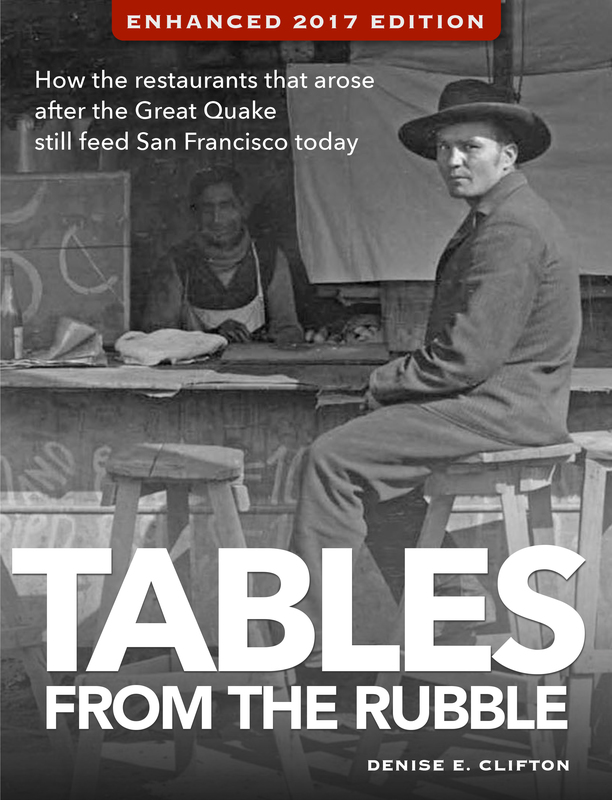 TABLES FROM THE RUBBLE transports readers to San Francisco in the years just after the Great Quake of 1906. Amid the ruins of a crumbled city, restaurants rose to feed the hungry and lead the recovery. Today a handful of the restaurants that opened in those years remain in San Francisco, serving customers in many of the same spaces they first opened – offering food, drinks and stories with a direct link to a century-old past. Featured restaurants include family-run establishments like Swan Oyster Depot, serving fresh seafood on the west side of Nob Hill since 1912; Liguria Bakery in North Beach, where the Soraccos have baked Italian bread since 1911; and Sam Wo in Chinatown, where the community rallied around the century-old restaurant to help it reopen after a closure that lasted for more than three years. 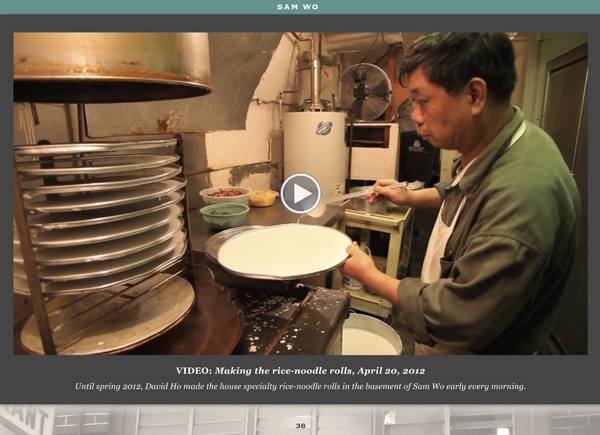 Sam Wo reopened in a new space in Chinatown in October 2015, retaining much of the menu that diners have enjoyed for decades. 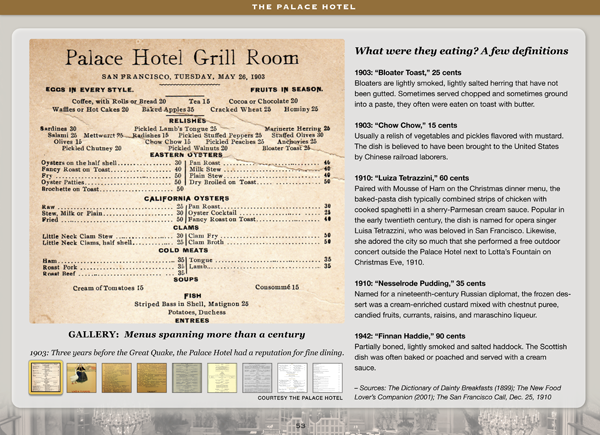 Also featured are the glamorous Palace Hotel, which reopened in 1909; the House of Shields bar across the street, a favorite South of Market destination since about 1912; the Comstock Saloon, which started out as a hangout for the boxing crowd; John’s Grill, which lays claim to being the first restaurant to open downtown after the quake; Schroeder’s, a German stalwart of the Financial District and one of the leaders of the downtown recovery; and many, many more. 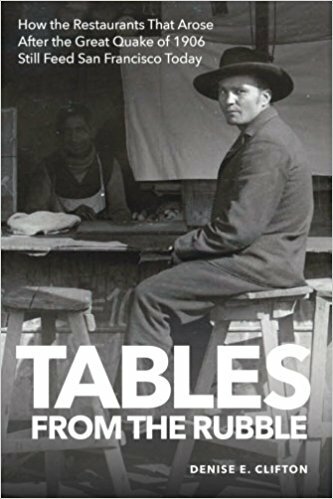 TABLES FROM THE RUBBLE is available in both paperback and multimedia editions. 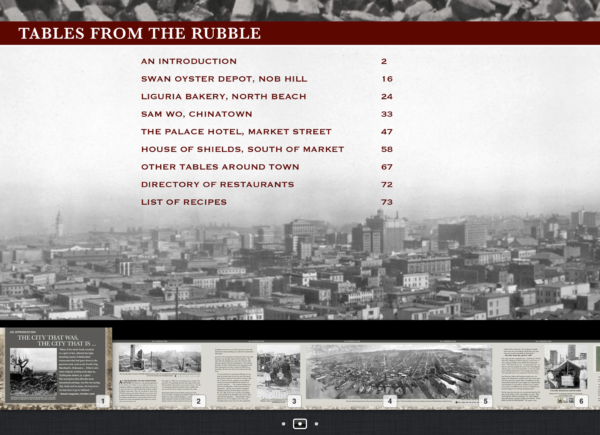 In the multimedia edition, the restaurants’ stories are presented in an exciting format designed for the rich displays of Mac and iOS systems, featuring photos, videos, recipes, historic menus and an interactive historic map. 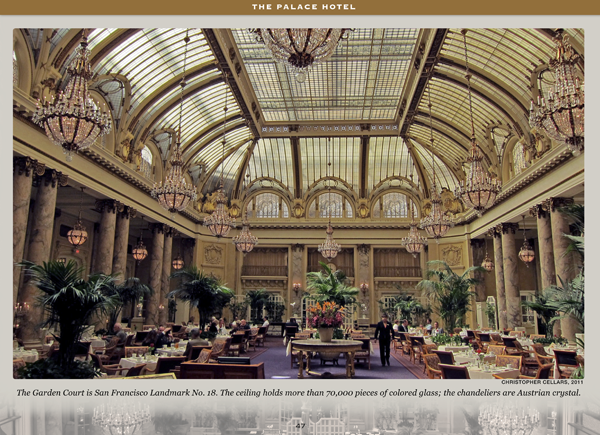 Explore old San Francisco in a revolutionary new way. VIDEOS: Geri Migielicz, executive editor of multimedia production company Story4, went behind the scenes to shoot videos for the multimedia edition of TABLES FROM THE RUBBLE at Swan Oyster Depot, Liguria Bakery, Sam Wo and the House of Shields. Geri also teaches multimedia at Stanford University, and at Story4, she is working on her first full-length documentary feature: The Cannon and the Flower. For more on Geri’s work and Story4 projects, see www.story4.org. 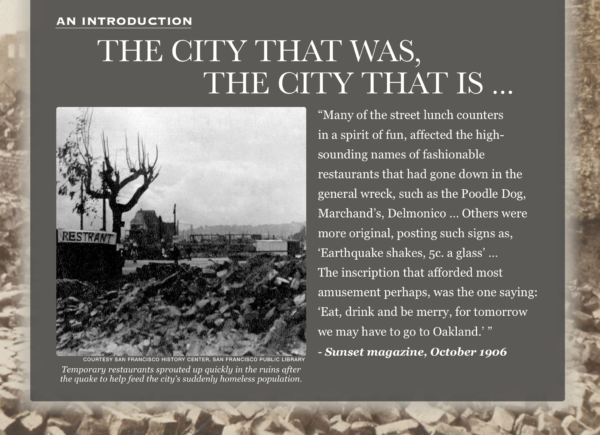 PHOTOGRAPHS: Dozens of historic photographs are included in TABLES FROM THE RUBBLE with permission from the California State Library, the California Historical Society, The Bancroft Library at University of California-Berkeley, the Chinese Historical Society of America, the San Francisco History Center at the San Francisco Public Library, the Library of Congress, U.S. Geological Survey, and the owners of the featured restaurants. In addition, dozens of new photographs accompany the restaurants’ stories. 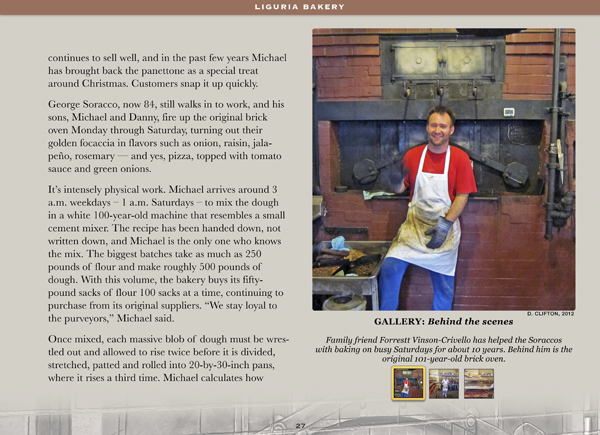 All photographs in the book can be viewed either next to the text or full-screen. 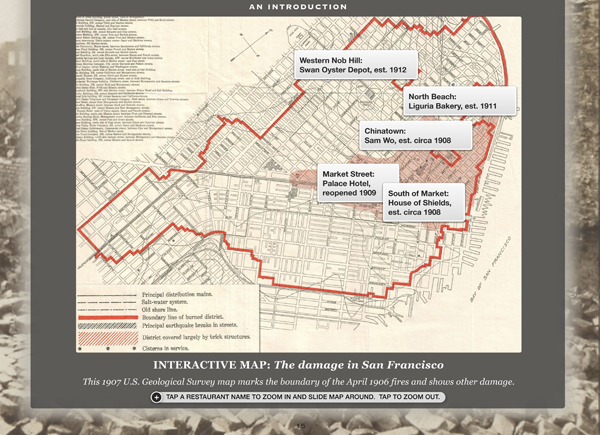 INTERACTIVE MAP: Readers of TABLES FROM THE RUBBLE can zoom in and explore a 1907 U.S. Geological Survey map that charts the post-earthquake damage in San Francisco. It shows the locations of the featured restaurants in the context of their neighborhoods. 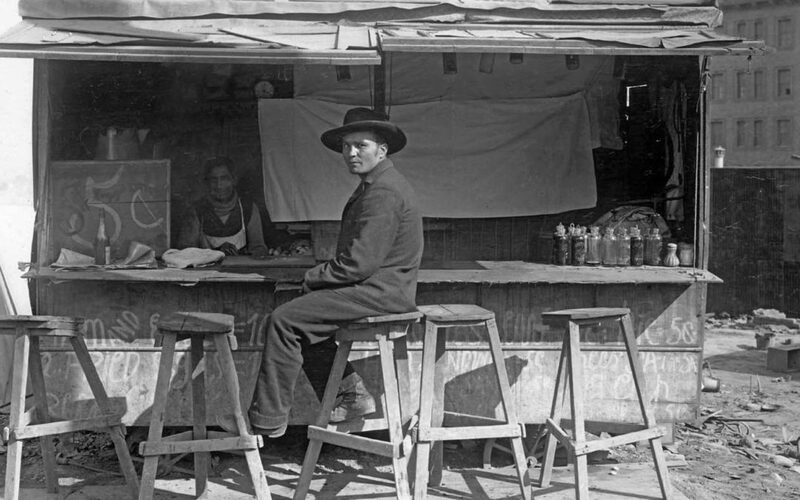 Photo courtesy of the California History Room, California State Library, Sacramento, Calif. Note: Parts of TABLES FROM THE RUBBLE first appeared as a freelance story in The Seattle Times’ NWTraveler section. Read that story here on seattletimes.com.